The Times reports on a proposal by New York City Mayor Bill de Blasio, to be unveiled at tonight's State of the City address, for a new streetcar line along the Brooklyn and Queens waterfronts. The "Brooklyn-Queens Connector," or BQX, would run from Astoria to Sunset Park, serving a 16-mile route at a projected cost of $2.5 billion. Let me not mince words: this is an awful project. $2.5 billion for 16 miles of light rail = more than $150 million a mile, which is so stratospheric as to seem an outright insult. The T Third Street light rail line in San Francisco cost $110M a mile, already well into the cost range for heavy rail, and unlike the proposed NYC project, some of the T has dedicated right of way. And dedicated ROW, not the mystical power of steel wheels, is the secret to faster vehicle speeds. By wasting money on fixed rail guideways and extremely expensive light-rail vehicles, this project guarantees that, all else equal, the frequency of service along this line will be (much) lower than it could have been, if the same alignment were served by less expensive buses. And frequency, not shiny trains, is the real secret to faster, more reliable door-to-door travel times! Rail transit presents serious logistical problems when vehicles break down. This includes both the streetcars themselves and the ubiquitous double parkers for which the outer boroughs are justly famous. Streetcars can't generally pass broken-down trains or abandoned cars - which adversely impacts reliability. And we're meant to pay more for this luxury? But one need look no farther than H Street in Washington, DC, to appreciate that steel rails alone move nobody (track was laid in 2009, but revenue service has yet to begin), and a glimpse at Buffalo's Main Street streetcar corridor should indicate that light rail can be an economic lightweight. Glen is not wrong when she states that New York's existing transit network no longer serves the city and region's changing and growing needs. But when resources are limited (and they always are), turn to buses! In some situations, full-blown heavy rail is justified - and indeed New York City is full of such situations; New York is also, not coincidentally, full of subway lines. But where the capacity and speed of true grade-separated transit is not economically justified, buses and bus rapid transit provide performance competitive with, and often superior to, light rail and streetcars at a tiny fraction of the price. In fact, it would be feasible to run a high-quality bus rapid transit line, with off-board fare collection, dedicated right of way, and traffic signal priority, along this (bad) alignment and still have well over $2 billion left over. Blowing all that money on a streetcar is what it looks like when people who do not fundamentally understand public transportation plan transit investments. Perhaps the only good news here is Mayor de Blasio there are two and a half billion dollars just sitting around waiting to be squandered on this terrible project. That's enough money to deliver a vast network of excellent bus rapid transit lines and increase bus service hours enormously. And these investments would actually make a difference for mobility in Brooklyn and Queens. As a transportation planner, I'm urgently interested in raising the public's awareness of the tradeoffs among project alternatives. In this task, I am up against a persistent bias among Americans toward rail transit and against bus transit, even when buses are, by the numbers, a much more appropriate solution. The tone of the comments section on the Times article was a mix of romantic interest in the idea of a streetcar and shock at the profligacy of this project. So perhaps there is hope yet. Ben Wellington at I Quant NY has a post up about trying to identify the beginning and end of NYC's "rush hour" using the Taxi and Limousine Commission's dataset of 2013 taxi trips. Ben's basic findings are about what you'd expect: most New York City car trips are rather slow. 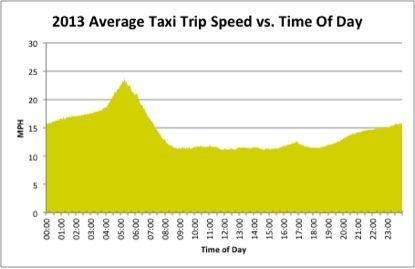 The average speed of all taxi trips was only 13.3 miles per hour; between 8 am and 7 pm that number is just 11.5 mph. I have some hesitations about Ben's analysis. He correctly notes an inherent flaw in his dataset - namely, taxi trips are not a representative sample of all vehicle trips; they are heavily skewed toward the central business district, where congestion is greater and vehicle speeds are lower. Beyond that, however, I would have liked to see some clarification about whether that 13.3 mph overall average speed was based on the crow-flies distance between each trip's start and end points, or took into account approximations of each trip's street route, the way Chris used the Google Directions API for his mesmerizing visualization. Absent any explicit statement, I have to assume the speed was based on crow-flies distances. (If Ben, or Chris, had run all 172 million trips through the Google Directions API, I would expect to have heard about it!) I am going to very roughly estimate the sinuosity of the average trip as about 1.3, which would mean the 13.3 mph figure would translate into something more like 17.3 mph average speed "as the taxi drives," which feels more accurate considering all those late night free-for-alls and long highway trips to and from the airports. Ben's speed graph also presents a good opportunity to discuss the dynamics of NYC taxi schedules. He notes that speeds are highest at 5:18 am, but suggests that this is because "the least traffic [is] on the road." Rather, the local peaks in average trip speed around 5 am and 5 pm can be attributed to the taxi driver shift changes that commonly occur around those times, when drivers return to fleet home bases often located in Queens. After those shift changes, drivers frequently seek passengers at JFK and LaGuardia airports, which leads to long trips mostly on highways. (Even congested highways generally flow faster than surface roads, at least in New York.) This dynamic is a major reason you can never get a cab during the afternoon rush, and, as I think about it, the codification of this system, which meets drivers' needs but not passengers', is probably helping Uber and now also Lyft demolish the taxi industry. On the whole, though, the I Quant NY post does accurately reflect a fundamental truth of NYC transportation: if you want to get there on time, skip the car! I can easily exceed the taxis' adjusted average daytime speed of 15 mph on my bicycle, and the subways average 17.4 mph night and day, rain or shine. "Go ahead and skip that cab to lunch," says Ben; go ahead and skip most other cab rides, too, say I. Today marks the four-month anniversary of the introduction of Citi Bike. This is as good a time as any for me to revisit the program's ridership data, as I promised in my original post from the four-week mark. Long story short: the system is thriving. Since my last post, NYC Bike Share has rolled out a System Data webpage, on which you can view and download substantial data on the system's usage thus far. The data is stored and displayed via Datawrapper; I'm not thrilled with the presentation (particularly the absence of tooltips to display exact values), but I'm surely grateful not to have to manually transcribe another three months' data off of blog posts. Data is available through Tuesday 9/24, so we have just over 17 weeks (and just under four months) to play around with. Of course, the first step is to validate all this new data. I was dismayed to identify several glaring inconsistencies within the provided numbers. The System Data page includes both daily and total counts for trips taken, miles traveled, and annual memberships sold, plus daily sales of 24-hour and 7-day memberships – but on numerous occasions, adding a day's trips taken to the cumulative total thus far yields a number different than the next day's cumulative total. (Similar problems abounded for miles traveled and annual memberships sold.) Most egregiously, the cumulative numbers for July 18 reflect an additional 12,666 trips and 317,494 miles (= a highly unlikely 25 miles per trip!) beyond the provided daily figures. So I've used the numbers I'd collected from the blog, along with simple arithmetic and common sense, to reconcile the conflicting values; all my data is available here for the curious. Having massaged our data into some semblance of consistency and plausibility, let's take another look at the key charts from my first post. (If you haven't read it, click here for background on why these figures are important.) It turns out that my first post, dated June 25, occurred right at the beginning of a substantial slide in membership sales. Around 6/23, users were purchasing nearly 2700 daily passes; by 7/10 that number had dropped 45% to under 1500. But at the same time, 7-day and annual membership sales made a comeback; since then, weekly memberships have continued to putter along (this is, perhaps, a category with limited demand; the new Bay Area Bike Share instead offers a three-day pass) while annual sales remain surprisingly robust for a system now beyond its infancy, and daily membership sales have stabilized around the 1500 mark. All in all, sales remain sizeable; when more information on the system's operating costs becomes available, I'll be able to assess whether they're bringing in enough business to cover costs. System use is extremely strong. The 7-day average "high" of 29,091 trips on 6/24 has turned out to be a "low" in comparison with the system's subsequent performance: Since July 14, the average daily ridership has not dropped below 30,000. At the same time, though, the continued growth in active members has kept the "trips per active member" ratio in check. I had hoped to see that figure continue its dramatic mid-June climb, but no such luck thus far; it's hovering around 0.45 as peak cycling season comes to a close. (Expect that number to drop come winter.) If the system does expand as promised and hoped, active members across the city would be able to use Citi Bike for more trips in more areas, likely leading to a rise in the trips-per-active-member ratio. The unsmoothed data remain noisy, but there is at least one important trend they reveal. It is easy to pick out weekends – when 24-hour membership sales explode – and Mondays, when satisfied 24-hour pass buyers seal the deal by purchasing an annual membership. But in late June, the daily trip count, which had up to that point been closely correlated with 24-hour pass sales, decouples from short-term memberships and begins to stay high throughout the week. My surmise (and hope) is that by the end of the program's first month, annual members began figuring out how to integrate Citi Bike more fully into their daily transportation routines. In any case, daily trips have continued to rise even as sales of short-term passes decline with the end of peak tourist season. It's quite clear from these charts and figures that Citi Bike has been performing excellently over its first four months when compared with its first four weeks. But that is probably not a very useful context. (In the United States' first four Presidential elections, the runner-up became the Vice President.) Instead, let's see how New York's system usage stacks up against a successful and established program across the Atlantic. London, population 8.3 million, has had Barclays Cycle Hire1 since 2010. With 8,000 bikes and 570 stations in operation, that three-year-old system logged 904,155 rides this August, split 50-50 between short-term riders and annual members; its all-time peak thus far was 47,105 rides in one day, during the 2012 Olympics. Meanwhile, a three-month-old Citi Bike, comprising 6,000 bikes and 330 stations2 in a city of the same population as London, recorded 1,115,340 rides in August, representing a whopping 6.0 trips per bike per day, 64% higher than London's usage levels. NYC's peak thus far was 44,083 rides on Saturday, August 18 – 94% of London's peak, which is not bad given the absence of any Olympic Games. Data isn't yet available on the percentage of Citi Bike rides taken by annual members vs. temporary members (a division roughly equivalent to "locals vs. tourists" or "work vs. play"), but we can approximately assess the proportions of utility trips vs. recreational trips by examining how many trips occur on weekdays vs. weekends. (This is imperfect, of course – many locals make utility trips on weekends, and most tourists' weekday trips are still recreational in nature – but bear with me.) In May and June, weekends saw substantially more use than weekdays, but in the months since, weekday usage has equalled and often exceeded weekend ridership. Combined with the decoupling of daily rides and 24-hour pass sales we saw above, this leads me to conclude that Citi Bike is less and less dominated by joyriding out-of-towners. Will Citi Bike, having attracted more than 84,000 annual members in its first four months, manage to equal the Boris Bikes' three-year sales figure (186,762)? Almost certainly. About 250 people per day are currently purchasing new annual memberships, a rate that, if sustained, would push total membership sales past the 100,000 mark in just over two months; and when those annual memberships begin to expire next summer, count on the vast majority of users to re-up. Indeed, I am predicting here and now that by June 1, 2015, Citi Bike will have sold more than 200,000 annual memberships. So: given Citi Bike's burgeoning ridership, its favorable performance compared to London's longer-established system, and the strong support/warm acceptance shown it by New York's mayoral candidates, it looks like bike share is here to stay. How has bike share been treating you so far? Are there any other bits of analysis you'd like to see in future updates? Going Dutch: Is Boston on board? Stasha recently called my attention to a lengthy and thoughtful article by Martine Powers in the Boston Globe, examining the components of the Netherlands' successful mainstreaming of utility cycling and considering how the techniques might be brought to America. Go read it. I'll wait. 2 and 3 are the same thing. In Manhattan, the 1st/2nd and 8th/9th Avenue bike lanes have features 1-4 (and cyclists love 'em!). Those lanes are among the best cycling infrastructure in the United States, and their appeal to novice cyclists is a testament to the effectiveness of the "Dutch" approach. I'm ambivalent about 6, unless the cyclists get the light slightly before drivers (allowing them to safely establish a presence before right-turners cut them off). Berlin has bike-specific signals, too, and the timing is staggered in this fashion at major intersections, and it works; but it's important to remember that Germany and the Netherlands are fundamentally more law-abiding cultures than the US, and that American cycling is still seen as something of a Wild West, so it may be quite some time before cycle-specific signalization gains traction, but I guess you have to start somewhere, if you want the American endgame to look like the Netherlands. 7 is not a feature of Dutch cycling infrastructure but rather a byproduct (and partial enabler?) of the ubiquity of utility cycling in the country. It was perhaps unwise for the Globe to bring up this issue, one of the most contentious* in the bike advocacy world. Shall we dismiss Australian utility cycling as doomed to fail, given that country's universal helmet requirement? The real game-changer, as far as infrastructure goes, is 5, which could greatly diminish the incidence of right hooks. 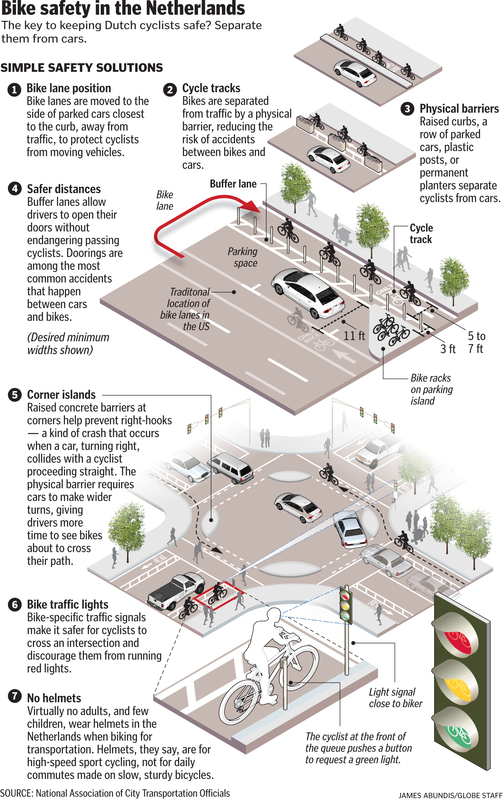 (One of the strongest arguments advanced by vehicular cyclists* is that separating bikes and cars using cycletracks actually decreases cyclists' safety at intersections, when they "suddenly appear" from directions drivers aren't expecting.) 5 is an elegant physical solution to that problem. The Dutch system of school-based cycling instruction and a "bike diploma" at around age 12 is wonderful. I had the good fortune of being raised by a mobility specialist, so had a very strong grounding from a young age in matters of street safety. I think such pedestrian/bicyclist education is very important, but I also feel strongly that there should be no legal licensing requirement for bicyclists. (They just don't pose enough danger to merit such a requirement.) But formalizing the education and training process - and making it as integral to primary school as driver's education was at my high school - is such a good way to disseminate life-saving information throughout society. The question that Powers' well-informed article raises, of course, is whether American cities in general - and Boston in particular - can or will go Dutch. It's a crucial question, because adopting and adapting a Dutch street model is about much more than widespread bike use: it's about street safety for all users, smart use of limited space, fostering walkable, human-scale communities, and adjusting our carbon footprint in the face of climate change. I'd love to hear from some Bostonians about how street safety and bike infrastructure are coming along in their neighborhoods; I'm planning to visit in November and will take the pulse myself. But in the meantime, this article and the progress it reports are heartening for me. Keep up the good work! * I don't want to get into the vehicular cycling debate, or the helmet debate, at least not here. But I surely will, down the road. I am a city person. I live in a city, I spend all my time thinking about and studying cities. But every so often, I like to punctuate that existence with a sharp contrast, so I'm off to raft the Rogue River, in southern Oregon, with family and friends. I'll be back on July 15 with some observations from San Francisco. The horrendous bicycle congestion in Amsterdam (“The Dutch Prize Their Pedal Power, but a Sea of Bikes Swamps Their Capital,” Amsterdam Journal, June 21) portends my worst fears for New York City if Mayor Michael R. Bloomberg’s crusade to promote cycling at any cost is not scaled back by his successor. In addition to the ubiquitous tombstone-like parking stands for the new bike-sharing program, Citi Bike, more and more bikes are appearing on our sidewalks, clumsily chained in bunches to anything stationary, cluttering pedestrian areas and complicating emergency services, trash collection and sanitation. The Times is inviting readers to respond to start a "dialogue," but where to even begin? Aesthetic disagreements (he sees tombstones, I see the physical plant of a new and exciting transportation mode) are only the surface of the problem, which is an animosity toward any new developments in the author's precious city. There has been so much "bike backlash" (though there has, in truth, not been much "bike lash" in the first place) that sane responses to baseless attacks are in greater demand than ever. 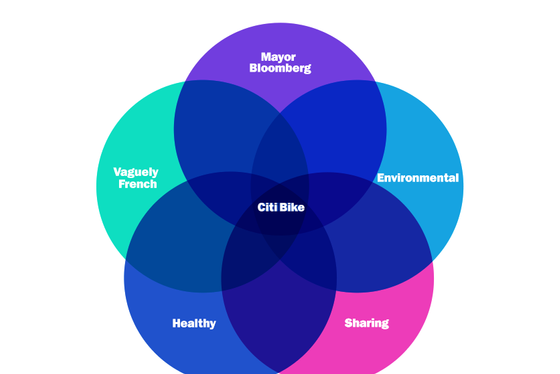 Dan Amira's glorious takedown in New York Magazine of conservatives' antipathy toward Citi Bike is really required reading in this genre - though his Venn diagram identifying categories of which conservatives are leery omits change itself. Gary Taustine should have his eyes checked. He sees more and more parked bicycles, and "tombstone-like" Citi Bike docking stations, but apparently is oblivious to bikes in motion, and to the hundreds of thousands of New Yorkers who ride them for transportation, work, and pleasure throughout the city. He also appears not to be able to see the signs permitting free on-street parking for private cars in our dense city. A bicycle locked neatly to a Department of Transportation-provided bike rack, taking up no more than four square feet of space, catches his eye, but the hundreds of square feet allocated to each car parking spot (some of the most valuable real estate in the world) are invisible to him. Most of all, Mr. Taustine cannot see the need, and the desire, for change in how New Yorkers get around. The number of commuters cycling to work has quadrupled since 2000; thousand-year storms are battering our shores more and more frequently; more and more citizens now share the same dense streets, and need to do so in space-efficient vehicles. Mr. Taustine sees bicycles - and the change they represent - as a menace. Perhaps he should take another look. The Times is still accepting responses through Tuesday evening; I encourage you to share your thoughts on Taustine's regrettable letter both here in the comments and to the Times directly. But how did I do? Citi Bike, New York's much anticipated, sometimes feared, and greatly needed bike share system, has now been in operation for four weeks. I have all manner of qualitative observations from this first month of service, but for now I'm going to lay out some quantitative analysis of the system's debut and early adoption. I'm working with data published daily on the Citi Bike blog, including some useful figures (daily trips, new membership sales) and some of questionable value (daily miles, average trip duration, most popular stations). 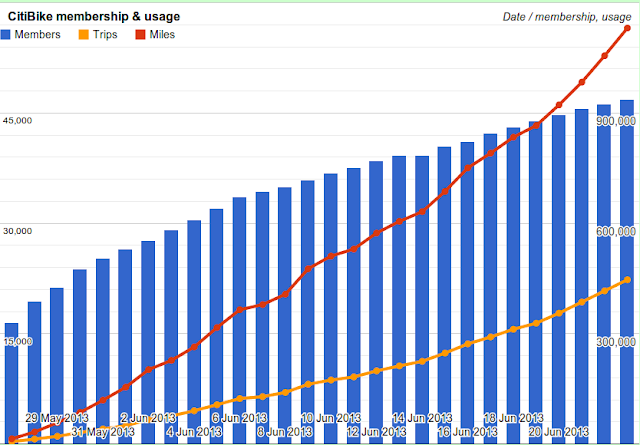 That latter category is not totally useless: over the weekend, the system reached the fun milestone of 1 million miles traveled, which makes for good press; and I suppose you could calculate the average systemwide speed, [EDIT: I did this just for kicks, and it's a mess. See below.] but it's the former on which I'll focus in an effort to track Citi Bike adoption and penetration rates. In fact, it was Antonio's graph that inspired me to dig a little deeper into the Citi Bike numbers. Graphing the total figures for each day is good if you just want to show that the system is getting use, but it's not particularly revealing. Since these are totals since inception, they will of course only ever increase. Instead, we want to examine daily differences - the first derivative of the total numbers - to see whether the rate of growth is increasing. As you can see, this is quite a noisy graph. The fact that there is so much daily variation makes it difficult to discern longer-term trends. For instance, was the system somehow four times better or more appealing on 6/9 than 6/7? Certainly not; 6/7 was very rainy, and 6/9 was a beautiful Sunday. We will examine the weather/trips relationship in a future post, but let's now deal with the weekend effect - the spike in ridership that occurs, unsurprisingly, on Saturdays and Sundays. This chart makes clear the advantage of the centered rolling average: as Wikipedia notes, it "ensures that variations in the mean are aligned with the variations in the data rather than being shifted in time." (The trailing average is three days behind the centered average, which results in consistent underestimation when the data are generally increasing, as is happily the case with Citi Bike usage.) The chart also demonstrates how the rolling average neutralizes the periodic peaks and troughs on weekends and weekdays. The data suggest that Citi Bike is performing quite well as measured by sales. Daily sales of 24-hour memberships have bounced around 2,100 for some time, but have recently skyrocketed; it remains to be seen whether that trend will hold up going forward. Weekly memberships initially failed to gain traction, dwindling to only 170 sales on 6/10, but have since gained traction, hovering around 400 daily sales since 6/19. Sales of annual memberships did see a fairly rapid, steady fall after launch, but stabilized around 6/10 and remained encouragingly flat through 6/20, since when they appear to have begun another slow decline. Even so, many hundreds of New Yorkers continue to join Citi Bike daily, nearly a month after the system's launch. This is heartening. This is perhaps the most heartening chart yet. As the total number of active members climbs steadily, the number of daily trips has dramatically risen (from about 12,500 on 6/10 to nearly 30,000 on 6/23), with a concomitant surge in trips per active member from a low of 0.32 to a recent high of 0.57. We may hope to see the trips-per-active-member figure continue to rise (surmounting 1.0 would be a great milestone), but the data so far suggest that Citi Bike is already becoming more and more important in the daily lives of its members. What's next in Citi Bike data analytics? The interactive charts in this post will continue to update as more data becomes available over time, but of course my commentary will not automatically adapt to reflect new trends. I'll try to check in every so often and address recent developments as Citi Bike continues to expand its presence in NYC. You can always visit my Google Spreadsheet to see the latest numbers. Of course, I'm not the only one exploring Citi Bike data. Greg is doing some great work analyzing the live station activity feed, and he's identified the most popular neighborhoods and come up with some good insights on best balancing practices. OpenPlans and betaNYC are holding a Citi Bike data night tomorrow. And there's a lot more data on the way, if NYC Bike Share makes good on its promise to follow Capital Bikeshare in releasing a web dashboard (though I hope they don't bury their data in a Silverlight application). This is troubling, because the values are so implausible. During the first week, the claimed average speed (on those bulky bikes) is around what I attain when I'm riding my road bike through the city in a hurry (I do stop for red lights, though) - that is, it's unrealistically high. After that, though, it gets even worse, as the speed is almost always given as 7.46 +/- 0.02. I find it very difficult to believe that Citi Bike users just happen to achieve almost exactly the same average speed day after day (albeit a speed that sounds realistic given the bikes and their riders). I'm not sure what to make of this suspicious data. It certainly shows the need for independent validation of blog data (using, say, the JSON feed). I'll keep an eye on this, though, and maybe inquire about it at tomorrow's bike share data evening.